The Sniper Ghost Warrior games have always favoured the more linear approach to gameplay. Moving from one mission to the next as the story unfolds. It is a classic way of videogame storytelling and gameplay that hasn’t been faulted for years. In the past few years however, video games have evolved and now prefer the player to have a lot more freedom when it comes to exploration and general gameplay. Open world games have taken over the videogames industry by storm allowing players to make their own stories within a main narrative. Sniper Ghost Warrior 3. is now breaking from its usual linear mold and jumping on the open world bandwagon, giving players the opportunity to mix things up a bit and tackle mission at their own pace. So what new things does the open world setting bring to Sniper Ghost Warrior 3? Sniper Ghost Warrior 3’s map is free for the player to explore. The map is full of missions, side quests and points of interests that the player can go to as and when they please. This freedom will not only make the game bigger but it will also give the player a more personal and tailored experience as they tackle the missions as and when they please. 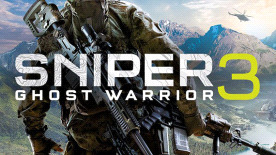 It seems as though that Sniper Ghost Warrior 3 features a brand new protagonist. This time around players jump into the shoes of Jonathan North, a retired American Marine who is dropped into Georgia to restore peace. The inclusion of a new protagonist alone could suggest that we may experience a brand new storyline that does not tie into the previous games at all. On the other hand, this maybe a new story that links into the series perfectly and we will bump into Cole Anderson along the way. As Sniper Ghost Warrior 3 is set in a open world, this has given the CI Games the opportunity to add more gameplay features. Vehicles and gadgets now play a massive part in this game. You will be able to use drones to help locate your target, you will also use a variety of vehicles in order to get around the map. You will also have access to zip lines as well in order to make a daring escape. That lists some of the huge changes that are coming to Sniper Ghost Warrior 3. We cannot wait to see what other changes will be included once we jump into the game.